The posterior cruciate ligament (PCL) of the knee has been the subject of many debates. The role of the PCL has become a topic of interest across the subspecialties of trauma, sports medicine,  and knee arthroplasty. 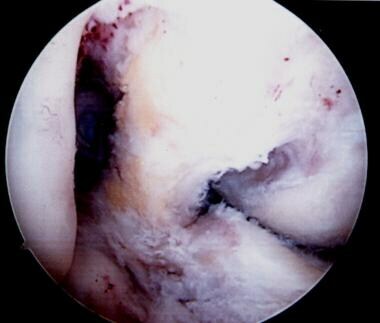 What, if any, treatment is required for a PCL-deficient knee is still a widely debated topic. Isolated PCL injuries are defined by the degree of posterior translation of the tibia with respect to the distal femoral condyles with the knee in 90° of flexion. These injuries can be tears in continuity or complete ruptures of the PCL. The consequences of an isolated PCL injury are poorly understood. PCL reconstruction has been advocated to restore knee kinematics to normal, which decreases the perceived risk of early degenerative joint disease. Many procedures have been described that are no longer in general use and are mentioned here only for the sake of completeness and historical interest. These were nonanatomic reconstructions using transfers of various structures, including the medial head of the gastrocnemius, the popliteus, and the semimembranosus. Current reconstruction is anatomic and attempts to recreate the PCL in the same manner as is done in anterior cruciate ligament (ACL) reconstruction. Although the development of early degenerative disease is controversial and has not been proved with clinical studies, the ability to restore normal knee kinematics with PCL reconstruction has also not been demonstrated in vivo. Thus, the PCL continues to be a topic of research and debate. A view of the broad origin of the posterior cruciate ligament (PCL) on the medial femoral condyle of a left knee. The anterior cruciate has been removed for surgical reconstruction. Image courtesy of Janos P. Ertl, MD. An additional view of the posterior cruciate ligament (PCL) broad origin and insertion in a knee pending anterior cruciate ligament (ACL) reconstruction. Image courtesy of Janos P. Ertl, MD. Gollehon et al applied a 100 N posterior load to cadaver knees at 90° of flexion and reported that the normal posterior translation was 5 mm. After isolated PCL sectioning, the posterior translation increased to 16 mm, whereas isolated lateral collateral ligament (LCL) and deep ligament complex sectioning increased the posterior translation by less than 3 mm. Sectioning of the PCL combined with sectioning of the LCL and deep ligament complex resulted in 25-30 mm translation; this amount was consistent throughout all positions of knee flexion. No series of acute isolated PCL reconstruction exists. The results in the literature are difficult to interpret because of variations in case selection and methods of evaluation. Techniques of reconstruction and the lengths of follow-up also vary. Consequently, the reported results vary. Lipscomb et al reported the results for 25 patients with isolated acute or chronic PCL injuries treated with single-tunnel technique. At an average of 7 years after surgery, 60% had degenerative changes identified on radiographs. Degenerative joint disease of the medial compartment is the most common late sequelae of PCL injury. Degeneration of the patellofemoral compartment also occurs, but less often. Stannard et al reported the results of 30 multiligament knee injuries with PCL ruptures. This was the first reported series of PCL reconstructions using the combination of the tibial inlay technique and the double-tunnel technique. At a mean follow-up of 25 months, no statistical difference was found between injured knees and normal knees. The outcome following PCL reconstruction for chronic PCL insufficiency has been worse than that of reconstruction for acute injuries. Postoperative posterior tibial laxity is greater after reconstruction for chronic PCL insufficiency than it is after acute PCL insufficiency, and patients with this injury cannot safely return to athletics. The diminished results of PCL reconstruction in patients with chronic knee insufficiency are thought to be the result of attenuation of the secondary restraints over time. PCL reconstruction inevitably fails if the posterolateral corner is insufficient or if the patient has developed a lateral thrust and the other pathology is not addressed. Grade 1 and 2 PCL injuries have been reported to heal without any progression of posterior tibial laxity. Grade 3 tears do not heal and progressive laxity may develop as secondary and tertiary posterior tibial stabilizers are stressed over time. Colvin AC, Meislin RJ. Posterior cruciate ligament injuries in the athlete: diagnosis and treatment. Bull NYU Hosp Jt Dis. 2009. 67(1):45-51. [Medline]. Jakob RP, Hassler H, Staeubli HU. Observations on rotatory instability of the lateral compartment of the knee. Experimental studies on the functional anatomy and the pathomechanism of the true and the reversed pivot shift sign. Acta Orthop Scand Suppl. 1981. 191:1-32. [Medline]. Warren RF, Arnoczky SP, Wickiewicz TL. Anatomy of the knee. Nicholas JA, Hershman EB, eds. The Lower Extremity and Spine in Sports Medicine. St Louis: Mosby; 1986. 657-94. Barton TM, Torg JS, Das M. Posterior cruciate ligament insufficiency. A review of the literature. Sports Med. 1984 Nov-Dec. 1(6):419-30. [Medline]. Girgis FG, Marshall JL, Monajem A. The cruciate ligaments of the knee joint. Anatomical, functional and experimental analysis. Clin Orthop. 1975 Jan-Feb. (106):216-31. [Medline]. Harner CD, Livesay GA, Kashiwaguchi S, et al. Comparative study of the size and shape of human anterior and posterior cruciate ligaments. J Orthop Res. 1995 May. 13(3):429-34. [Medline]. Scapinelli R. Studies on the vasculature of the human knee joint. Acta Anat (Basel). 1968. 70(3):305-31. [Medline]. Kennedy JC, Alexander IJ, Hayes KC. Nerve supply of the human knee and its functional importance. Am J Sports Med. 1982 Nov-Dec. 10(6):329-35. [Medline]. Schultz RA, Miller DC, Kerr CS, Micheli L. Mechanoreceptors in human cruciate ligaments. A histological study. J Bone Joint Surg Am. 1984 Sep. 66(7):1072-6. [Medline]. Schutte MJ, Dabezies EJ, Zimny ML, Happel LT. Neural anatomy of the human anterior cruciate ligament. J Bone Joint Surg Am. 1987 Feb. 69(2):243-7. [Medline]. HELLER L, LANGMAN J. THE MENISCO-FEMORAL LIGAMENTS OF THE HUMAN KNEE. J Bone Joint Surg Br. 1964 May. 46:307-13. [Medline]. Kennedy JC, Hawkins RJ, Willis RB, Danylchuck KD. Tension studies of human knee ligaments. Yield point, ultimate failure, and disruption of the cruciate and tibial collateral ligaments. J Bone Joint Surg Am. 1976 Apr. 58(3):350-5. [Medline]. Prietto MP, Bain JR, Stonebrook SN. Tensile strength of the human posterior cruciate ligament (PCL). Trans Orthop Res Soc. 1988. 13:195. Butler DL, Noyes FR, Grood ES. Ligamentous restraints to anterior-posterior drawer in the human knee. A biomechanical study. J Bone Joint Surg Am. 1980 Mar. 62(2):259-70. [Medline]. Fox RJ, Harner CD, Sakane M, et al. Determination of the in situ forces in the human posterior cruciate ligament using robotic technology. A cadaveric study. Am J Sports Med. 1998 May-Jun. 26(3):395-401. [Medline]. Harner CD, Vogrin TM, Kanamori A. Effects of axial compression on the function of the posterior cruciate ligament. Trans Orthop Res Soc. 2000. 25:780. Hoher J, Harner CD, Vogrin TM. Hamstring loading increases in situ forces in the PCL. Trans Orthop Res Soc. 1998. 23:48. Harner CD, Hoher J, Vogrin TM, et al. The effects of a popliteus muscle load on in situ forces in the posterior cruciate ligament and on knee kinematics. A human cadaveric study. Am J Sports Med. 1998 Sep-Oct. 26(5):669-73. [Medline]. Harner CD, Xerogeanes JW, Livesay GA, et al. The human posterior cruciate ligament complex: an interdisciplinary study. Ligament morphology and biomechanical evaluation. Am J Sports Med. 1995 Nov-Dec. 23(6):736-45. [Medline]. Harner CD, Janaushek MA, Kanamori A, et al. Biomechanical analysis of a double-bundle posterior cruciate ligament reconstruction. Am J Sports Med. 2000 Mar-Apr. 28(2):144-51. [Medline]. Ahmad CS, Cohen ZA, Levine WN, et al. Codominance of the individual posterior cruciate ligament bundles. An analysis of bundle lengths and orientation. Am J Sports Med. 2003 Mar-Apr. 31(2):221-5. [Medline]. Harner CD, Janaushek MA, Kanamori A. Effect of knee flexion angle and tibial position during graft fixation on the biomechanics of a PCL reconstructed knee. Trans Orthop Res Soc. 1999. 24:23. Jari S, Shelbourne KD. Natural history and nonoperative treatment of posterior cruciate ligament injuries. Oper Tech Sports Med. 2001. 9:53-9. Seitlinger G, Scheurecker G, Högler R, Labey L, Innocenti B, Hofmann S. Tibial tubercle-posterior cruciate ligament distance: a new measurement to define the position of the tibial tubercle in patients with patellar dislocation. Am J Sports Med. 2012 May. 40(5):1119-25. [Medline]. Bach BR. Graft selection for posterior cruciate ligament surgery. Oper Tech Sports Med. 1993. 2:104-9. Clendenin MB, DeLee JC, Heckman JD. Interstitial tears of the posterior cruciate ligament of the knee. Orthopedics. 1980 Aug 1. 3 (8):764-72. [Medline]. Fanelli GC, Giannotti BF, Edson CJ. The posterior cruciate ligament arthroscopic evaluation and treatment. Arthroscopy. 1994 Dec. 10(6):673-88. [Medline]. Clancy WG Jr, Sutherland TB. Combined posterior cruciate ligament injuries. Clin Sports Med. 1994 Jul. 13(3):629-47. [Medline]. Hughston JC, Bowden JA, Andrews JR, Norwood LA. Acute tears of the posterior cruciate ligament. Results of operative treatment. J Bone Joint Surg Am. 1980 Apr. 62(3):438-50. [Medline]. Hughston JC, Degenhardt TC. Reconstruction of the posterior cruciate ligament. Clin Orthop Relat Res. 1982 Apr. (164):59-77. [Medline]. Lipscomb AB, Johnston RK, Snyder RB. The technique of cruciate ligament reconstruction. Am J Sports Med. 1981 Mar-Apr. 9(2):77-81. [Medline]. Bergfeld JA. Diagnosis and nonoperative treatment of acute posterior cruciate ligament injury. Instr Course Lect. 1990. 208. Panisset JC, Duraffour H, Vasconcelos W, Colombet P, Javois C, Potel JF, et al. [Clinical, radiological and arthroscopic analysis of the ACL tear. A prospective study of 418 cases]. Rev Chir Orthop Reparatrice Appar Mot. 2008 Dec. 94(8 Suppl):362-8. [Medline]. Moore HA, Larson RL. Posterior cruciate ligament injuries. Results of early surgical repair. Am J Sports Med. 1980 Mar-Apr. 8(2):68-78. [Medline]. Savatsky GH, Marshall JL, Warren RF. Posterior cruciate ligament injury. Orthop Trans. 1980. 4:293. Noyes FR, Barber-Westin SD. Decision making and surgical treatment of posterior cruciate ligament ruptures. Scott WN, ed. Insall and Scott Surgery of the Knee. 6th ed. Philadelphia: Elsevier; 2018. 719-90. Musahl V, Ayeni OR, Citak M, Irrgang JJ, Pearle AD, Wickiewicz TL. The influence of bony morphology on the magnitude of the pivot shift. Knee Surg Sports Traumatol Arthrosc. 2010 Sep. 18 (9):1232-8. [Medline]. Hewett TE, Noyes FR, Lee MD. Diagnosis of complete and partial posterior cruciate ligament ruptures. Stress radiography compared with KT-1000 arthrometer and posterior drawer testing. Am J Sports Med. 1997 Sep-Oct. 25(5):648-55. [Medline]. Gross ML, Grover JS, Bassett LW, et al. Magnetic resonance imaging of the posterior cruciate ligament. Clinical use to improve diagnostic accuracy. Am J Sports Med. 1992 Nov-Dec. 20(6):732-7. [Medline]. Patten RM, Richardson ML, Zink-Brody G, Rolfe BA. Complete vs partial-thickness tears of the posterior cruciate ligament: MR findings. J Comput Assist Tomogr. 1994 Sep-Oct. 18(5):793-9. [Medline]. Bellelli A, Mancini P, Polito M, David V, Mariani PP. Magnetic resonance imaging of posterior cruciate ligament injuries: a new classification of traumatic tears. Radiol Med (Torino). 2006 Sep. 111(6):828-35. [Medline]. Donell ST, Marshall TJ, Darrah C, Shepstone L. Cruciate ligament assessment in MRI scans: a pilot study of a static drawer technique. Knee. 2006 Mar. 13(2):137-44. [Medline]. Yoon YC, Chung HW, Ahn JH. MR imaging of stable posterior cruciate ligament grafts in 21 arthroscopically proven cases. Korean J Radiol. 2007 Sep-Oct. 8(5):403-9. [Medline]. Yoon JP, Chang CB, Yoo JH, Kim SJ, Choi JY, Choi JA, et al. Correlation of magnetic resonance imaging findings with the chronicity of an anterior cruciate ligament tear. J Bone Joint Surg Am. 2010 Feb. 92(2):353-60. [Medline]. Orakzai SH, Egan CM, Eustace S, Kenny P, O'flanagan SJ, Keogh P. Correlation of intra-articular osseous measurements with posterior cruciate ligament length on MRI scans. Br J Radiol. 2010 Jan. 83(985):23-7. [Medline]. Espregueira-Mendes J, Pereira H, Sevivas N, Passos C, Vasconcelos JC, Monteiro A, et al. Assessment of rotatory laxity in anterior cruciate ligament-deficient knees using magnetic resonance imaging with Porto-knee testing device. Knee Surg Sports Traumatol Arthrosc. 2012 Apr. 20(4):671-8. [Medline]. Okazaki K, Tashiro Y, Izawa T, Matsuda S, Iwamoto Y. Rotatory laxity evaluation of the knee using modified Slocum's test in open magnetic resonance imaging. Knee Surg Sports Traumatol Arthrosc. 2012 Apr. 20(4):679-85. [Medline]. Shelbourne KD, Jennings RW, Vahey TN. Magnetic resonance imaging of posterior cruciate ligament injuries: assessment of healing. Am J Knee Surg. 1999 Fall. 12(4):209-13. [Medline]. Tewes DP, Fritts HM, Fields RD, et al. Chronically injured posterior cruciate ligament: magnetic resonance imaging. Clin Orthop. 1997 Feb. (335):224-32. [Medline]. Bisson LJ, Clancy WG. Posterior cruciate ligament. Garrett WE, Speer KP, Kirkendall DT, eds. Principles and Practice of Orthopaedic Sports Medicine. Philadelphia: Lippincott Williams & Wilkins; 2000. 763-86. Moulton SG, Geeslin AG, LaPrade RF. A Systematic Review of the Outcomes of Posterolateral Corner Knee Injuries, Part 2: Surgical Treatment of Chronic Injuries. Am J Sports Med. 2016 Jun. 44 (6):1616-23. [Medline]. Torg JS, Barton TM, Pavlov H, Stine R. Natural history of the posterior cruciate ligament-deficient knee. Clin Orthop. 1989 Sep. (246):208-16. [Medline]. Dejour H, Walch G, Peyrot J, Eberhard P. [The natural history of rupture of the posterior cruciate ligament]. Rev Chir Orthop Reparatrice Appar Mot. 1988. 74(1):35-43. [Medline]. Keller PM, Shelbourne KD, McCarroll JR, Rettig AC. Nonoperatively treated isolated posterior cruciate ligament injuries. Am J Sports Med. 1993 Jan-Feb. 21(1):132-6. [Medline]. Geissler WB, Whipple TL. Intraarticular abnormalities in association with posterior cruciate ligament injuries. Am J Sports Med. 1993 Nov-Dec. 21(6):846-9. [Medline]. Boynton MD, Tietjens BR. Long-term followup of the untreated isolated posterior cruciate ligament-deficient knee. Am J Sports Med. 1996 May-Jun. 24(3):306-10. [Medline]. Skyhar MJ, Warren RF, Ortiz GJ, et al. The effects of sectioning of the posterior cruciate ligament and the posterolateral complex on the articular contact pressures within the knee. J Bone Joint Surg Am. 1993 May. 75(5):694-9. [Medline]. MacDonald P, Miniaci A, Fowler P, et al. A biomechanical analysis of joint contact forces in the posterior cruciate deficient knee. Knee Surg Sports Traumatol Arthrosc. 1996. 3(4):252-5. [Medline]. Buyukdogan K, Laidlaw MS, Miller MD. Surgical Management of the Multiple-Ligament Knee Injury. Arthrosc Tech. 2018 Feb. 7 (2):e147-e164. [Medline]. [Full Text]. Noyes FR, Barber-Westin SD. Treatment of complex injuries involving the posterior cruciate and posterolateral ligaments of the knee. Am J Knee Surg. 1996 Fall. 9 (4):200-14. [Medline]. Chan YS, Yang SC, Chang CH, Chen AC, Yuan LJ, Hsu KY, et al. Arthroscopic reconstruction of the posterior cruciate ligament with use of a quadruple hamstring tendon graft with 3- to 5-year follow-up. Arthroscopy. 2006 Jul. 22(7):762-70. [Medline]. Paulos LE, Bair BA. Transosseous reconstruction of the posterior cruciate ligament: single- and double-tunnel techniques. Oper Tech Sports Med. 2001. 9:60-8. McAllister DR, Bergfeld JA, Kambic H. A biomechanical comparison of posterior cruciate ligament reconstruction techniques. Presented at the AAOS 66th Annual Meeting. Anaheim, CA. February 1999. Bergfeld JA, Graham SM. Tibial inlay procedure for PCL reconstruction: One tunnel and two tunnel. Oper Tech Sports Med. 2001. 9:69-75. Edelson R, Bergfeld JA, Katchis S. Biomechanical effects of an alternative tibial attachment site in bone-patellar tendon-bone reconstruction of the PCL. Presented at the AAOS 62nd Annual Meeting, AAOSM Specialty Day. February 1996. Race A, Amis AA. The mechanical properties of the two bundles of the human posterior cruciate ligament. J Biomech. 1994 Jan. 27(1):13-24. [Medline]. Harner CD, Hoher J. Evaluation and treatment of posterior cruciate ligament injuries. Am J Sports Med. 1998 May-Jun. 26(3):471-82. [Medline]. Lipscomb AB Jr, Anderson AF, Norwig ED, et al. Isolated posterior cruciate ligament reconstruction. Long-term results. Am J Sports Med. 1993 Jul-Aug. 21(4):490-6. [Medline]. Loos WC, Fox JM, Blazina ME, et al. Acute posterior cruciate ligament injuries. Am J Sports Med. 1981 Mar-Apr. 9(2):86-92. [Medline]. Race A, Amis AA. PCL reconstruction. In vitro biomechanical comparison of ''isometric'' versus single and double-bundled ''anatomic'' grafts. J Bone Joint Surg Br. 1998 Jan. 80(1):173-9. [Medline]. Clancy WG, Bisson LJ. Double tunnel technique for reconstruction of the posterior cruciate ligament. Oper Tech Sports Med. 1999. 7:110-7. Fanelli GC, Edson CJ, Reinheimer KN, Garofalo R. Posterior cruciate ligament and posterolateral corner reconstruction. Sports Med Arthrosc. 2007 Dec. 15(4):168-75. [Medline]. Hayashi R, Kitamura N, Kondo E, Anaguchi Y, Tohyama H, Yasuda K. Simultaneous anterior and posterior cruciate ligament reconstruction in chronic knee instabilities: surgical concepts and clinical outcome. Knee Surg Sports Traumatol Arthrosc. 2008 Aug. 16(8):763-9. [Medline]. Lateral radiograph of a normal knee. In a normal knee, a line drawn along the posterior femoral condyle does not intersect the posterior tibial condyle. Image courtesy of Janos P. Ertl, MD. Lateral radiograph of a knee with a posterior cruciate ligament injury. Note that the same line as in the image above bisects the posterior tibial condyle due to a posterior sag and an incompetent PCL. Image courtesy of Janos P. Ertl, MD. The photo on the left demonstrates the clinical finding of the posterior tibia sag sign. A line drawn parallel to the patella accentuates the posterior tibia sag. The photo on the right demonstrates the quadriceps active drawer test described by Daniels; with the knee in 70-90° of flexion, the extensor mechanism is contracted, pulling the tibia anteriorly into a reduced position. Image courtesy of Janos P. Ertl, MD. Close-up view of a posterior tibia sag with an incompetent posterior cruciate ligament (PCL). Image courtesy of Janos P. Ertl, MD. A right knee pending posterior cruciate ligament (PCL) reconstruction. A minimal notchplasty is completed. Two guide pins are advanced into the medial femoral condyle for tunnel placement to reconstruct the two bundles of the PCL. Image courtesy of Janos P. Ertl, MD. The two femoral tunnels are created by reaming from outside in; 8- to 9-mm tunnels are made depending on the patient size and graft used. Image courtesy of Janos P. Ertl, MD. Two red Robinson catheters are advanced through the femoral tunnels. Image courtesy of Janos P. Ertl, MD. The catheters have premade holes that are used for suture retrieval. Image courtesy of Janos P. Ertl, MD. The catheters are advanced and threaded out the posterior knee. In this case, a posterior tibial inlay graft from an Achilles tendon allograft is used. The two bundles are secured to the catheters and advanced into the joint through the tunnels. Image courtesy of Janos P. Ertl, MD. The two Achilles tendon bundles are secured with a baseball whipstitch, threaded through the catheter holes, and advanced into the femoral condyle tunnels. Image courtesy of Janos P. Ertl, MD. Additional view of the placement and advancement of the Achilles allograft. Image courtesy of Janos P. Ertl, MD. Completion and seating of the femoral allograft reconstruction. The two bundles are secured or stabilized by suturing over a post and washer. 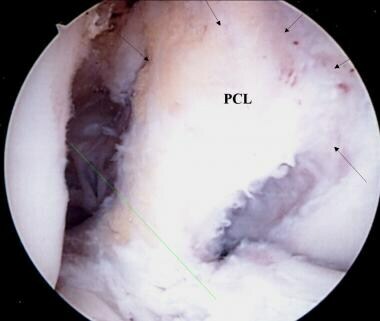 Note the re-establishment of the broad surface area for the reconstructed posterior cruciate ligament (PCL) origin. Image courtesy of Janos P. Ertl, MD. Completion of the tibial inlay two-bundle Achilles tendon allograft/posterior cruciate ligament (PCL) reconstruction. The bony calcaneus remnant is secured to the posterior tibia with one or two interfragmentary compression screws into a trough into the posterior tibia at the level of the PCL insertion. Care is taken not to penetrate the anterior tibial cortex with these screws. Note the intact original anterior cruciate ligament (ACL). Image courtesy of Janos P. Ertl, MD. Posterior sag of the left posterior cruciate ligament–deficient knee in comparison to the right knee. Note the posterior subluxation of the tibia relative to the femur of the left knee. Image courtesy of Robert Bronstein, MD. Clinical examination photograph of a ruptured posterior cruciate ligament (PCL) confirmed on a posterior sagittal radiograph. Image courtesy of Mervyn J. Cross, MBBS, FRACS. Radiograph depicting a chronic avulsed posterior cruciate ligament (PCL). Image courtesy of Mervyn J. Cross, MBBS, FRACS. An MRI showing a torn posterior cruciate ligament (PCL). Image courtesy of Mervyn J. Cross, MBBS, FRACS. Sagittal view radiograph showing a posterior cruciate ligament (PCL) rupture. Note the posterior positioning of the tibia in relation to the femur. Image courtesy of Mervyn J. Cross, MBBS, FRACS.